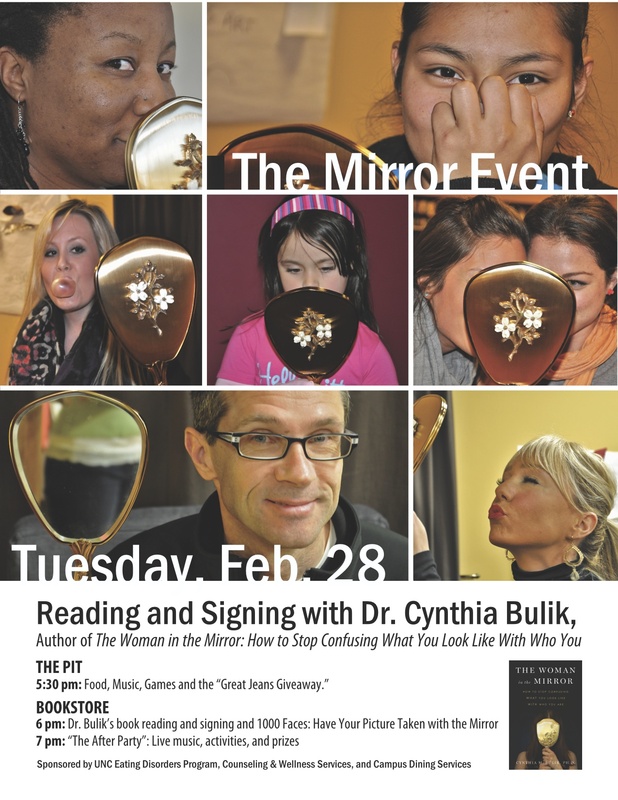 The Mirror Event: Book signing with Dr. Cynthia Bulik, Food, Live Music, and Mirror Pictures!! Been anxiously awaiting to take your picture with The Mirror? Now’s your chance! Kick starting National Eating Disorders Awareness Week, the UNC Eating Disorders Program has partnered with Counseling and Wellness Services and Campus Dining Services to bring you The Mirror Event, including a book reading and signing with Dr. Cynthia Bulik, author of The Woman in the Mirror: How to Stop Confusing What You Look Like With Who You Are, live music, activities and PRIZES, and pictures with The Mirror! At 6:00pm in the student bookstore, meet UNC’s own, Dr. Cynthia Bulik! Helping women and men around the world reclaim body esteem and self-esteem, Dr. Bulik’s new book, The Woman in the Mirror, has been regarded by Claire Vickery, founder of The Butterfly Foundation, as a “significant culture kicker around the globe.” At The Mirror Event, participants will listen to excerpts from The Woman in the Mirror and engage in lively discussion facilitated by Dr. Bulik, followed by the chance to have their book signed and their picture taken with The Mirror! With just a “flash,” you can launch your new relationship with your reflection, cultivating inner peace with your appearance, and freeing precious brain-real estate for work, relationships, and community. From 7-7:30pm, Elysse Thebner, local musician, and a surprise bandmate will hit the stage, performing live, while raffle winners are announced and festivities (and pictures) continue! Join us for a self-esteem booster shot by celebrating all of the varied and colorful qualities that make us unique individuals. Join UNC to raise awareness about eating disorders during NEDAwareness Week! Check out The Mirror Event facebook page and invite your friends!